At Weddings By Dzign, we love a couple who knows what they want—and Alexandra and Chad came into the wedding planning process with a gorgeous design in mind. They knew they wanted a fresh look and feel for their affair, with tons of greenery and white florals throughout—and we were so honored to help bring their distinct (and dreamy) wedding vision to life with the help of our talented Las Vegas wedding floral team, Floral By Dzign. 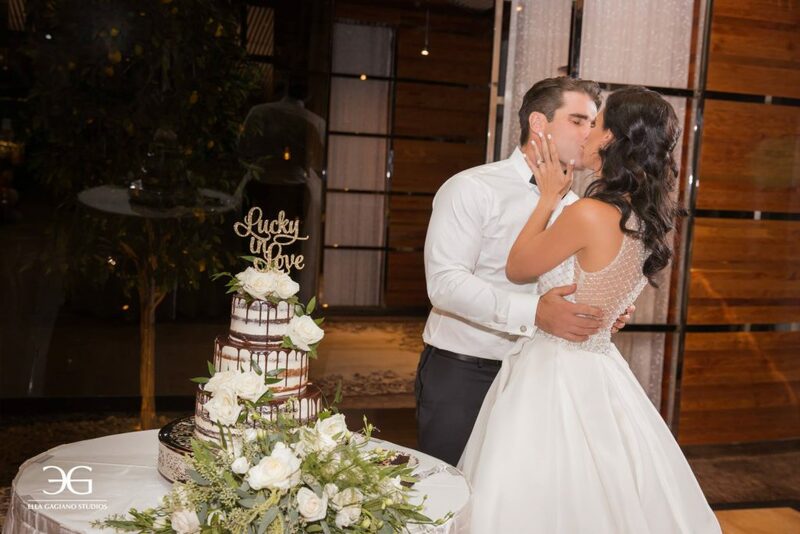 The couple originally met in 2010—Chad plays hockey with Alexandra’s brother, and the pair hit it off at her brother’s annual Halloween party that year. The duo fell in love and Chad later proposed on a beautiful hike in Elk Falls while they were visiting his hometown. With Alexandra’s busy career as an occupational therapist and Chad’s as a power engineer, the newly engaged pair knew they needed to bring in wedding design and floral experts to help bring their vision of dripping, dreamy greenery and clean white flowers to life—and our team at Weddings By Dzign couldn’t wait to get started. 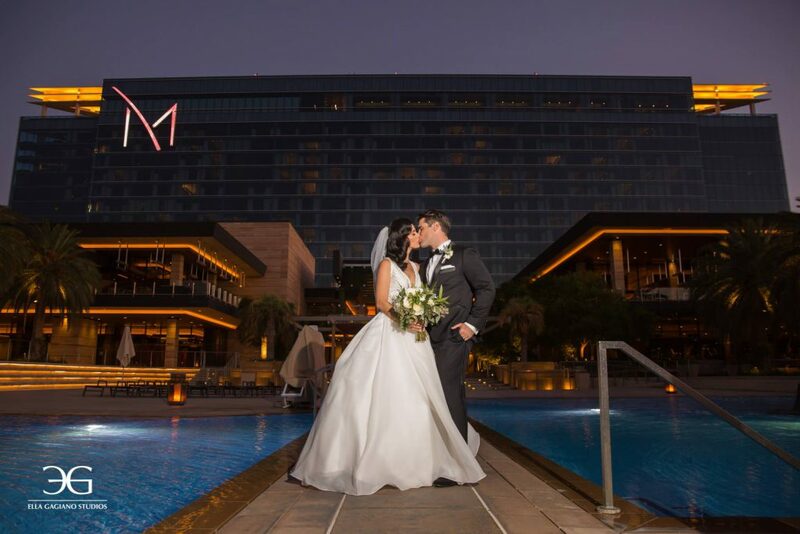 The couple decided to host their wedding at M Resort in Las Vegas in September, one of the city’s most beautiful months, and Alex also asked that we work a bit of sparkle into their stunning soirée (and peppering some gold and bling throughout was right up our design team’s alley). 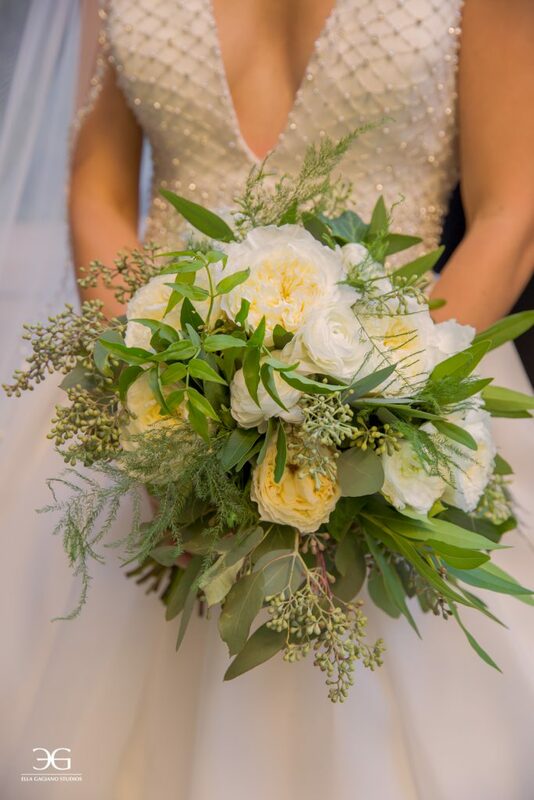 For Alexandra’s bridal bouquet, Floral By Dzign created a beautiful, loose arrangement of white garden roses, white ranunculus, seeded eucalyptus, and sprawling sprigs of Italian ruskus throughout. 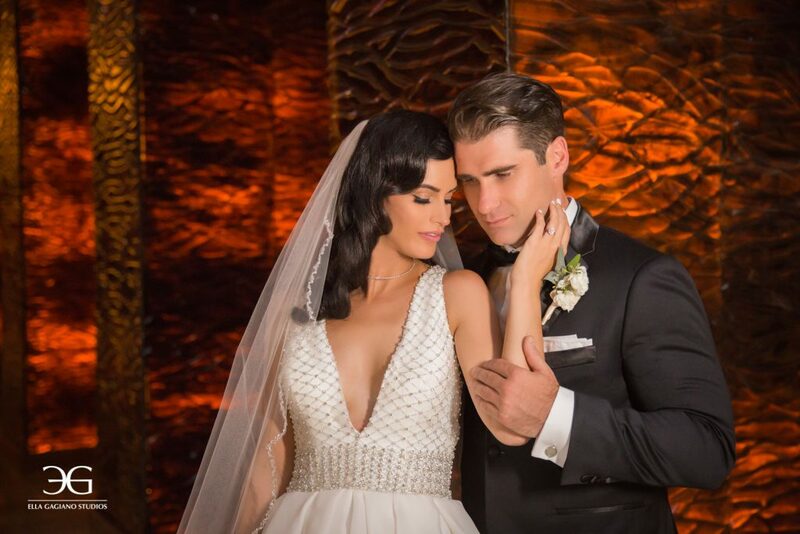 Our Las Vegas wedding floral experts then tied Chad’s boutonniere into his beautiful bride’s bouquet by hand-crafting a duo of white ranunculus, accented with seeded eucalyptus for that natural greenery look Alexandra was going for. 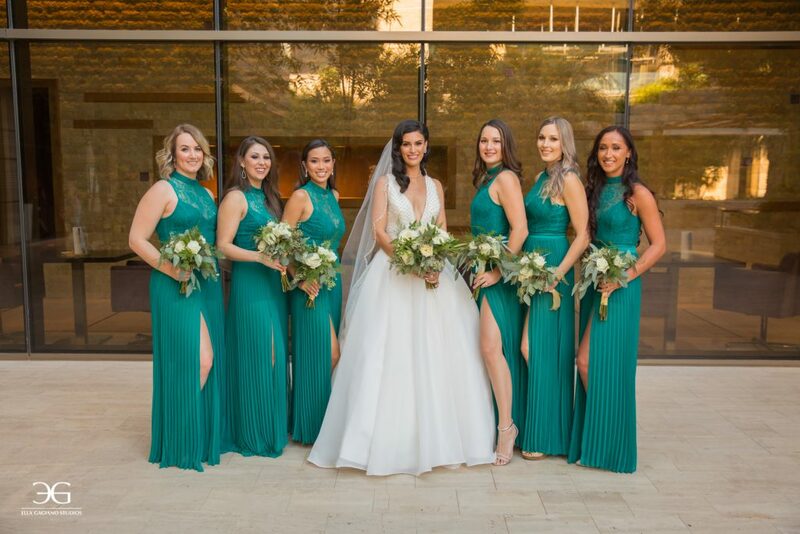 Bridesmaids wore stunning deep turquoise gowns (we can’t get over that swoon-worthy gem tone!) 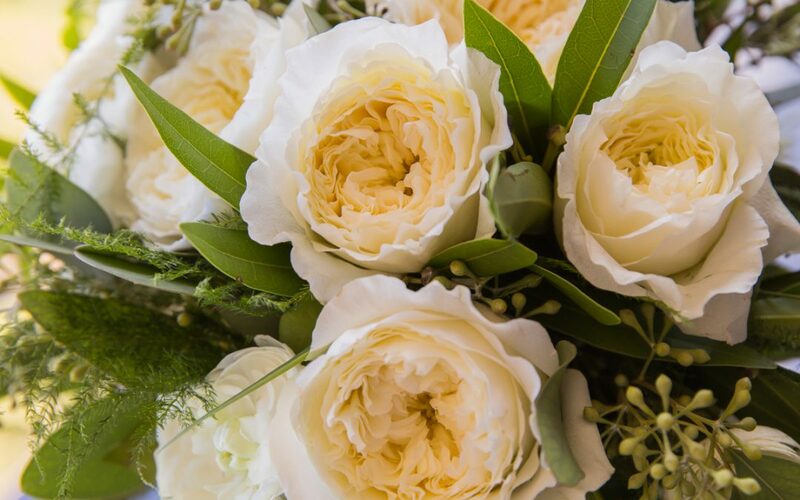 and donned bouquets that matched the bride’s perfectly—white garden roses were accented with seeded eucalyptus and sprigs of oh-so natural Italian ruskus throughout. For the couple’s ceremony, we brought in a gorgeous natural wood arbor. 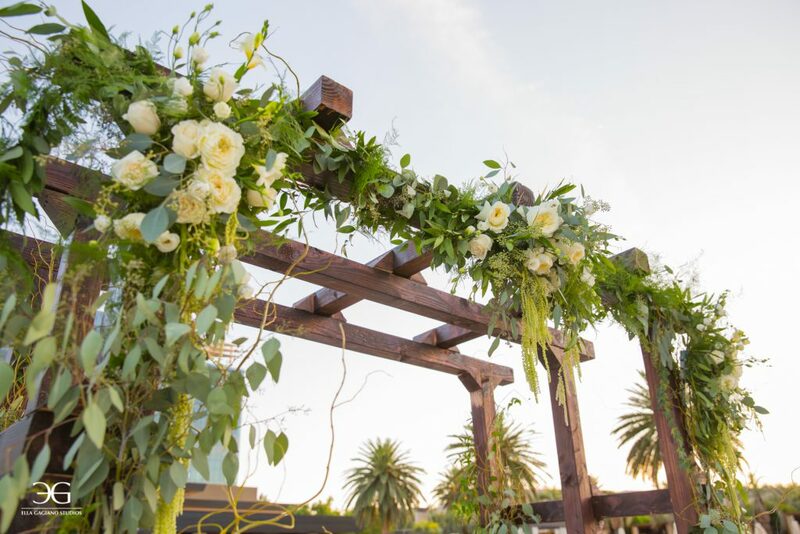 Floral By Dzign then accented the arch with a mix of greenery, curly willow, white garden roses, white roses, and spray roses. The overall look landed somewhere between romantic-boho and au-natural Fairytale—ultimately creating an altar area that was dripping in whimsical greenery and wild romance at once. Guests then moved indoors for the reception, where the crowd sang “Brown Eyed Girl” as Chad and Alexandra shared their first dance (talk about a Kleenex-worthy moment!). 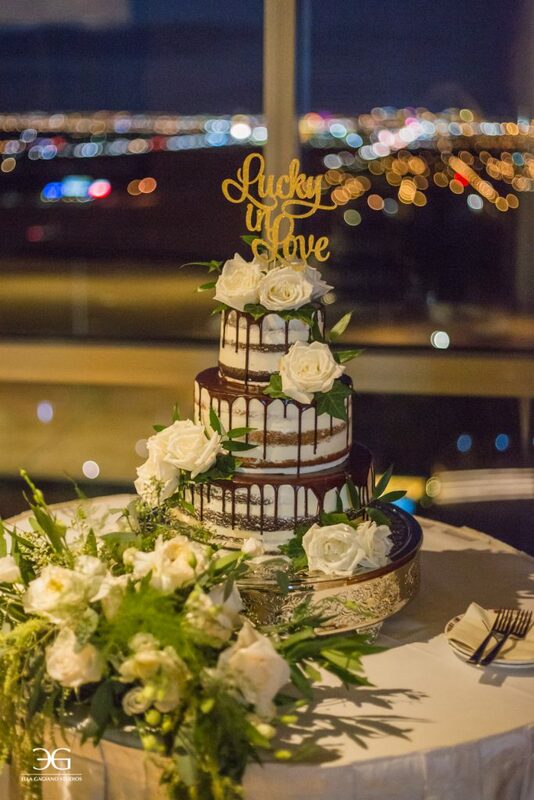 To help create a reception aesthetic that was cohesive with that of the ceremony, our Las Vegas wedding floral crew adorned the newlyweds’ gorgeous naked cake with lush white roses and a touch of Italian ruskus. 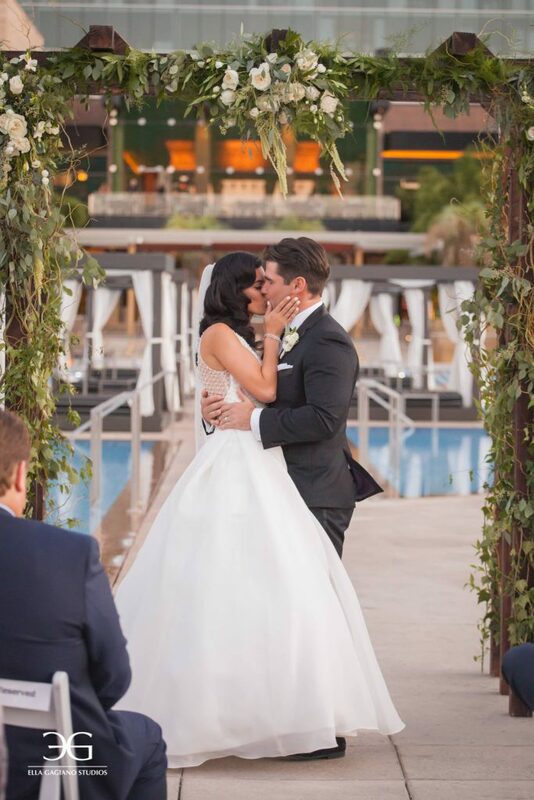 Overall, Alexandra and Chad’s whimsical M Resort nuptials were dripping in greenery and white roses—and accented with just the right amount of gold, of course—and we couldn’t be happier with how the event turned out. 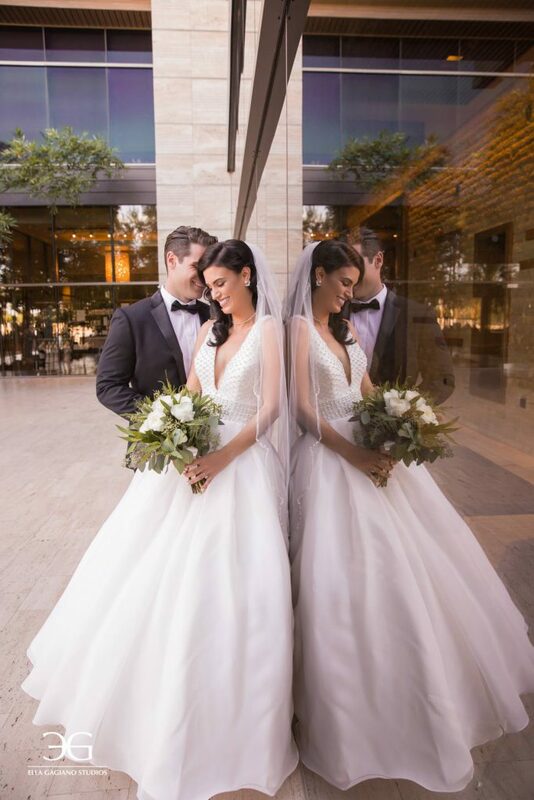 Our team was honored to work with this gorgeous couple to help bring their wedding vision to life, and we wish them a lifetime of endless love and infinite adventure!